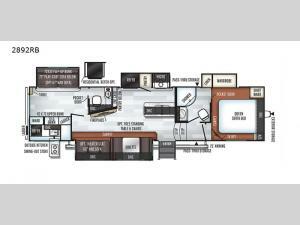 Your kids will love camping in this Forest River Rockwood Ultra Lite 2892RB fifth wheel! It features a decked out rear bunkhouse with two upper bunks, one with a 72" play-cube sofa below and a table, and the other with a wardrobe and drawers below along with a ladder to safely get up. If you're feeling generous then you can even add the optional TV, plus there is a pocket door entrance into their very own half bath, which will come in very handy at night. Your kids will also love all of the snacks that you can bring along and store in not only one pantry, but two pantries, one of which is located underneath the entertainment center. What better way to relax at night than to sit on the 60" hide-a-bed sofa in front of the fireplace and watch your favorite movie on the LED TV or you can head outside and play games underneath the 18' power awning with LED lights, all you need is to grab a table and chair!